In my part of New England this is the “I have to admit I’m not going to get these planted…” time of year. I have a couple of shrubs that I’m not sure where I’m going to place them, and some small plants that will be donated to a non-profit next season. And then there are a couple odds and ends that just didn’t get placed in the garden and here it is, almost Thanksgiving. If you find yourself wondering what you should do with plants you haven’t gotten into the ground, here’s a method that works well. The gardener’s term for this is “heeling in.” Basically it’s making sure the roots are buried for the winter. You can leave plants in their pots if the pots are plastic, but if the pot is ceramic you’ll want to remove the plant first. Did a trench large enough to accomodate all your pots. A sheltered location is ideal, so somewhere next to a building or where there is something to break the wind is perfect. We use the edge of our open compost pile and cover the pots with a mix of compost and soil. All soil is fine too. Leave the tops of the plants sticking up but bury the pots and rootballs. You can add a light layer of pine needles, hay or leaves later as the weather grows colder, but don’t put those on top of your plants right away; when you mulch too early the mice and voles are likely to find the area to be a cozy retreat, complete with snacks. So wait until later in December for additional covering. We put several small pots of plants in black plastic crates so that they can just be lifted out in the spring. The larger pots are placed next to them, marked with a couple of bamboo stakes so we don’t forget where they are should they become covered with oak leaves over the next few months. 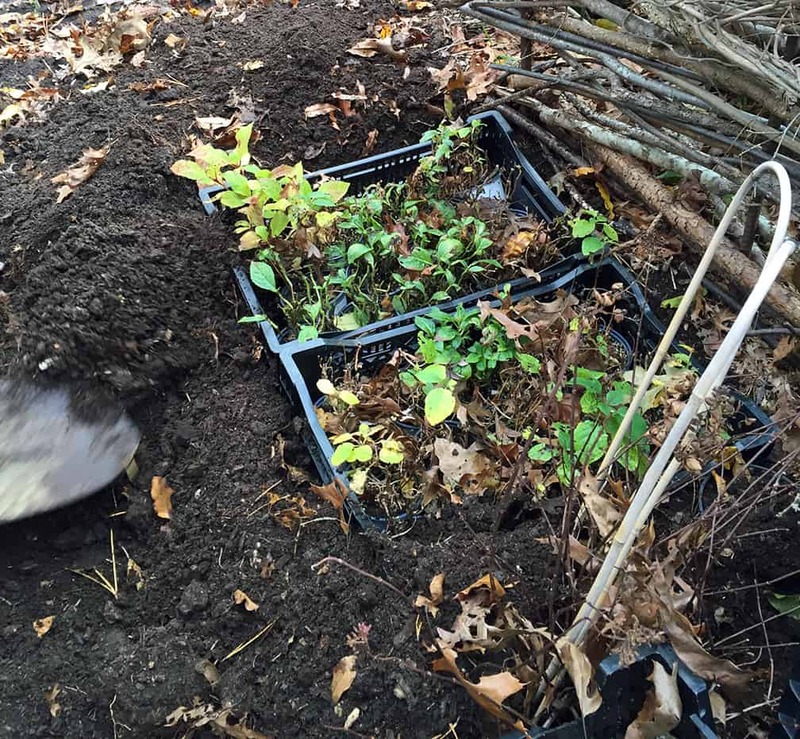 In this photo we are just starting to shovel the dirt and compost over these crates – now that they are covered the plants show but the rims of all the pots are covered.